← Does Amnesty International support Bassem Tamimi’s quest to start a “Third Intifada”? When I first heard about “Vegans against the occupation,” I thought for a moment that this was surely a group opposing the Chinese occupation of Tibet. After all, even though Tibet’s climate makes it difficult to be a vegetarian or vegan, Buddhism has traditionally been very sensitive about the suffering of animals and is often associated with promoting vegetarian or even vegan diets. But of course I was wrong: “Vegans against the occupation” is just another group with an intense hatred for Israel – so intense, in fact, that one of the leading members of this small group has been devoting a lot of energy to promoting the Tamimis of Nabi Saleh, who obviously couldn’t care less about veganism. But Ariel Gold, aka Ariel Gold-Vegan of Ithaca, New York, hates Israel more than she hates this kind of revolting “fun”. While “Vegans against the occupation” is a tiny group that doesn’t warrant much attention, it provides an excellent example of the bottomless hypocrisy that is the hallmark of anti-Israel activism. Among animal rights activists, Palestinians have something of an international reputation for being particularly cruel to animals. But while her friends were getting ready to slaughter animals and pose with their remains, Ariel Gold was busy baking “Vegan Anti-Zionist Sweet Potato Challah” and bragging about how she raised her “vegan” children “to recognize zionism as a racist ideology rooted in ethnic cleansing.” Even her son’s bar mitzvah was all about Gold’s anti-Israel activism. And it’s probably like real vegan bacon to hate Israel intensely while idolizing people who can get more than 200 FB “Likes” for a photo of a teenaged relative posing mockingly with the severed head of a slaughtered animal. To be sure, that the Tamimis are amused by one of their family members imitating the look of a slaughtered goat is really a minor matter. What is incomparably worse is the fact that the Tamimis don’t mind the slaughter of human beings – or, to be precise: the slaughter of Jews. I did quite a bit of research on the Tamimis for several articles I wrote in the wake of the recent viral video that showed the futile attempt of an Israeli soldier to arrest the 12-year-old Mohammad Tamimi for stone throwing. First I noticed that some of their publicly accessible FB posts include statements and material that is hard to square with their otherwise carefully cultivated image as “non-violent” activists and “human rights defenders.” There are, for example, FB “likes” from Bassem Tamimi for pages and comments promoting the Hamas-affiliated jihadist Al-Qassam Brigades. Moreover, while the Tamimis have always refused to condemn terrorism, I was taken aback to see that Bassem Tamimi’s wife Nariman openly shared a popular FB post that objected to the description of the perpetrators of several murderous terror attacks as “terrorists” and insisted they should be hailed as “rebels.” Perhaps unsurprisingly, one of these murderous “rebels” is Tamimi family member Ahlam Tamimi, the mastermind of the 2001 Sbarro pizzeria massacre in Jerusalem. 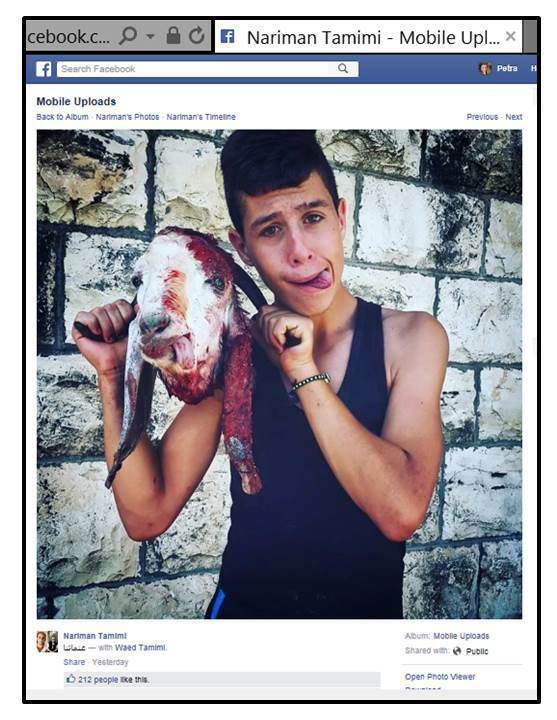 Chances are that Ariel Gold (-Vegan) will be more disturbed by the tasteless image Nariman Tamimi shared on FB than by her open display of support for an unrepentant murderer who was only too delighted to find out that her victims included eight children. 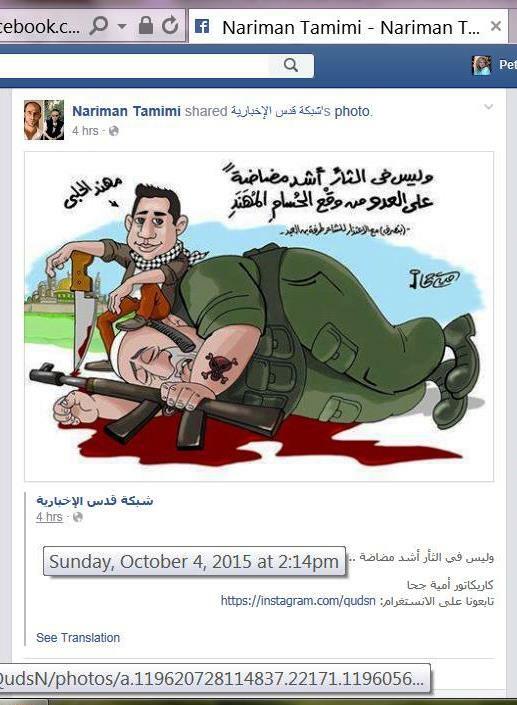 In the wake of the recent terror attack in Jerusalem that claimed the lives of two men and left one woman seriously injured and one toddler lightly injured, Bassem Tamimi’s wife Nariman posted a cartoon glorifying the lethal stabbing on her FB page. The cartoon misleadingly suggests that the terrorist was targeting a soldier, whereas in reality he was targeting a couple with two children returning from prayers at the Western Wall. Nariman Tamimi shared this cartoon from a Palestinian news site, where it was “liked” by almost 14,000 people and shared by almost 1,700. In addition to this cartoon, Nariman Tamimi and other members of her family posted countless other endorsements of terrorism on social media. I have documented a few examples in a previous post and will add more material. Most notable, however, is the Tamimis’ ongoing promotion of the vile ideology of Sbarro massacre mastermind Ahlam Tamimi, which I have documented in a recent guest post at Elder of Ziyon’s blog. While there is clear evidence indicating that the FB page revealed in this post is indeed Ahlam Tamimi’s page, it is obvious that even if it is maintained by someone else, the page promotes her vicious views – and Bassem Tamimi as well as his wife and daughter are FB “friends” with this person. 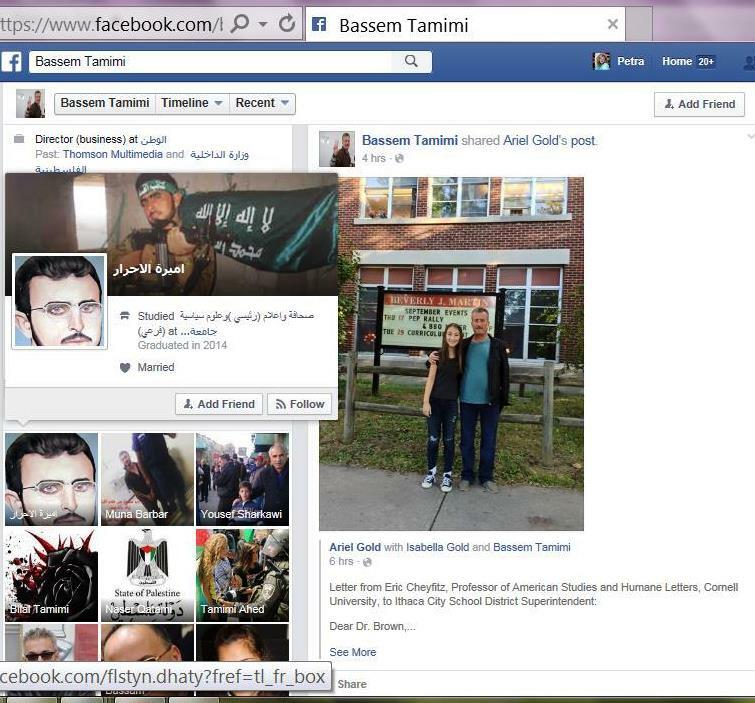 Below a screenshot from Bassem Tamimi’s FB page, taken recently when he had just shared one of Ariel Gold’s many posts promoting him (and shamelessly using her daughter for this purpose), with the sidebar icon showing his FB “friends” including the “Princess of the Free” Ahlam Tamimi, whose FB profile and cover picture show the man who detonated the bomb at the crowded Sbarro restaurant in Jerusalem in August 2001. That is the company Ariel Gold (-Vegan) wants for her own children, and these are the people Gold wants third-graders in her town Ithaca (NY) to admire. This entry was posted in Uncategorized and tagged Israel, Tamimi, terrorism. Bookmark the permalink. Thanks Petra! This is about the craziest thing I ever heard of. Non-violence is generally supposed to be associated with such diets, though not always, of course. One thing that struck me is that the boy with the goat doesn’t realize how much alike they are; his terrorist masters would sacrifice him just as lightly as he sacrificed the goat.